The Lord of the Rings: The Motion Picture Trilogy (The Fellowshi.. Season 1 Summers span decades. Winters can last a lifetime. And the struggle for the Iron Throne has begun. It will stretch from the south, where heat breeds plots, lusts and intrigues; to the vast and savage eastern lands; all the way to the frozen north..
Nat 'King' Cole Trio & Pauline & Her Perils - Transcriptions Vol..
Chloe King is a seemingly normal girl. She goes to class (most of the time), fights with her mom, and crushes on a boy…or two. But around her sixteenth birthday, Chloe finds that perhaps she isn’t so normal after all. There’s the heightened night vis..
Jon Hartley Fox tells the story of a small outsider record company in Cincinnati, Ohio, that attracted an extremely diverse roster of artists, including the Stanley Brothers, Grandpa Jones, Redd Foxx, Earl Bostic, Bill Doggett, Lonnie Johnson, Ike Turner, .. Certainly no one in the Polish-German community of his youth could have foreseen his influence on the direction of American popular music or his enduring fame on the stage of the Grand Ole Opry. Even Pee Wee King himself is incredulous at the unlikely twis..
His life has been filled with hilarious, never-been-told stories...until now! His reign consists of thirteen championships (one of which he&apos;&apos;s held more than forty times), three marriages, and two children. He&apos;&apos;s dominated Memphis radio..
Simmons Beautyrest 200 Tc Mp Cal King Beautyrest 200 Thead Count.. 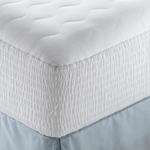 This mattress pad boasts a 200 thread count cotton top cloth and is filled with dreamloft® fiber. The Expand-A-Grip® skirt is designed to hold securely to any mattress up to 15 deep and is machine washable. 200 Thread Count Mattress Pad Features: Mat..
Simmons Trizone Mattress Pad King Pima Cotton Trizone Mattress P..
"Simmons Trizone Mattress Pad Brand New Includes One Year Warranty, Pima Cotton TriZone Features: 300 Thead Count, 100 Egyptian Cotton Sateen, Dual Layer, Pocket depth: 20 inches, Machine Washable, King Dimensions: 76"" x 80"", Made in the U.S.A."
Serta Everyday Mattress Protector King Serta Everyday Mattress P.. 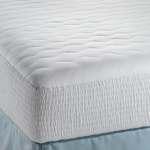 The mattress features a breathable mattress barrier to protect your mattress from spills and stains, while protecting against common bedding allergens. The mattress protector fits mattress heights of upto 18 inches. Everday Mattress Protector Features: Mat..
Simmons Microfiber Mp Cal King Simmons Beautyrest Microfiber Mat.. This microfiber mattress pad boasts a 200 thread count and is filled with hypo-allergenic polyester fibers. The bioshield anti-microbial prevents the growth of odor causing bacteria, mold, mildew and fungus, keeping your mattress pad cleaner and fresher fo..
Serta Elite Mattress Protector King Serta Elite Mattress Protect.. The built-in 3M Scotchgard™ dual-action protection ensures that the spills bead up and are wiped away without reaching the mattress. The mattress protector remains cool and breathable while resisting molds, dust mites, allergens, bacteria, and odors. .. This cotton pillow comes with polyester fiber fill and its bedding has 220 thread count . It features twill stripe pattern and is machine washable. Beautyrest Twill Stripe Pillow Features: King Size Pillow, Polyester Fiber, Twill Stripe Pattern, 220 Thread..
Protect-a-bed Basic Mattress Protector King Basic Mattress Prote.. The Unique Miracle Membrane® keeps the mattress free of spoils and stains. The fitted sheet style mattress cover is easy to remove, re-use, and is machine washable. 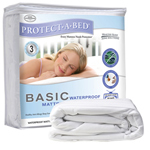 Basic Mattress Protector Features: Basic Mattress Protector, 100 Polyster Material, Dust..